The Vancouver Condo Buzz » LAUNCH! 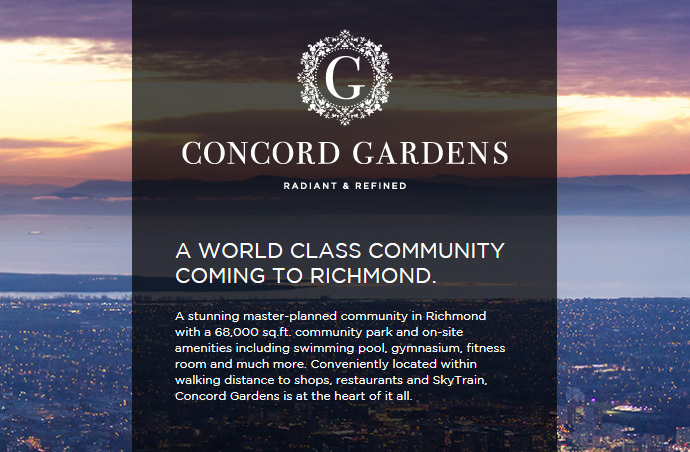 Concord Gardens Richmond Master Planned Condo Community with 68,000sf Park by Concord Pacific > 1 to 3 Bedroom Richmond Concord Gardens Condos from $236,800! LAUNCH! 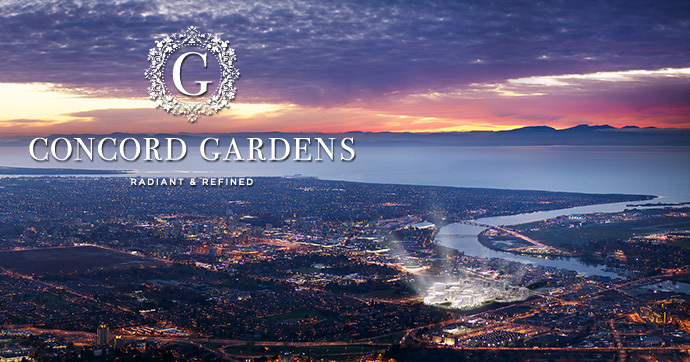 Concord Gardens Richmond Master Planned Condo Community with 68,000sf Park by Concord Pacific > 1 to 3 Bedroom Richmond Concord Gardens Condos from $236,800! A massive master planned community is coming soon to Richmond! Brought to you by master builder Concord Pacific, Concord Gardens Richmond condo project is a stunning new community designed from ground up. Featuring 1 to 3 bedroom Richmond condos for sale starting from an affordable price point of just $236,800, the new Richmond Concord Gardens condos will certainly have something for every home buyer or investor. Multiple residential towers plus townhomes will be featured in this landmark Richmond real estate development and the Concord Pacific Concord Gardens Richmond condos will be situated on Garden City Road. As part of this master-planned neighbourhood, Concord Gardens Richmond condo project will also see the addition of a massive 68,000 square foot urban park and green space for all to enjoy. Other on-site amenity spaces at the presale Richmond Concord Gardens condo project will include a swimming pool, fitness gym and a gymnasium for basketball and racquet sports. 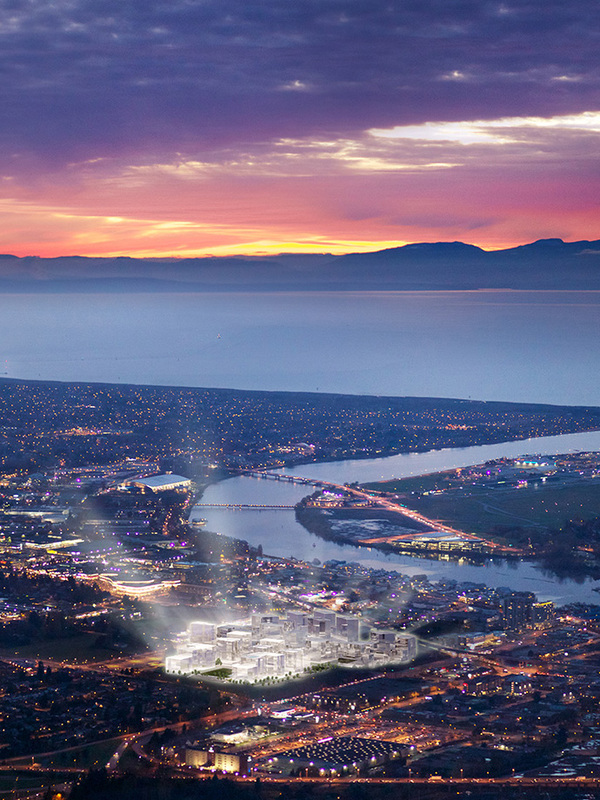 Other great selling features for the presale Richmond Concord Gardens Concord Pacific real estate development includes its close proximity to everything that the City of Richmond has to offer. This includes hundreds of boutique stores and big box retail stores, international cuisine and of course, the SkyTrain to connect you to YVR as well as downtown Vancouver and beyond. All of this can be yours for under $250,000! SPECIAL DISCOUNTS for Early Pre-Sale Richmond Concord Gardens Condo Buyers! Just out > there will be great incentives for homebuyers who purchase during the grand opening pre-sales at the Concord Gardens Richmond condo project by world renowned Concord Pacific. With close to 1,000 approximate suites for sale, there will be something for everyone. The new Richmond Concord Gardens condos will feature junior 1 bedrooms to 3 bedroom homes and will start from a very affordable price point of just $236,800 before discounts. Here is the latest information regarding the early pre-sale discounts at the Richmond Concord Gardens condos. Please note that these are subject to change at any time. Please register your interest for more details as they are released. GRAND OPENING THIS SATURDAY AT CONCORD PACIFIC CONCORD GARDENS RICHMOND CONDOS, APRIL 20TH CHANCE TO WIN A TOTAL OF $5,000 CASH DRAW! Join us this Saturday, April 20th, from noon to 6:00 pm, for the Grand Opening of the very first release of the largest master-planned community in Richmond – North Block at Concord Gardens. Light refreshments will be served along with a draw of a total of $5,000 in cash. *prices for 1 Bedroom suites do not include parking. All other suite types include one parking stall. VISIT OUR RICHMOND SALES CENTRE today or contact our sales executives for more information. ** Grand Opening Special offer cannot be assigned or transferred and is only applicable to original home owners. Home owners must pay property tax and strata fee first and apply for reimbursement within a designated time. One bedroom suite is eligible for $1,000 furniture allowance, 2 bedroom suite is eligible for $2,000 furniture allowance and 3 bedroom suite is eligible for $3,000 furniture allowance. This is a limited time offer. A WORLD CLASS COMMUNITY COMING TO RICHMOND CONCORD GARDENS. Would you like to live in a new community with a 68,000 square foot new park? Are onsite amenities important to you? How about a swimming pool and a fitness room and a gym? Want to be within walking distance to thousands of shops and restaurants in addition to mass transit routes? Look no further as the new pre-construction Richmond Concord Gardens master planned community is coming early Spring 2013! Brought to you by Concord Pacific Concord Gardens Richmond condo project is one of the largest residential developments ever in the Lower Mainland and will be eventually home to close to one thousand new market suites. Close to the SkyTrain and main bus routes in addition to all of the international shops and dining options available, the pre-construction Richmond Concord Gardens condos is one of the most promising and sought after new projects of 2013. The display suite is currently under construction and the new Richmond Concord Gardens floor plans will be released shortly. The grand opening preview was on February 16th and 17th to celebrate Chinese New Year with Concord Pacific but if you didn’t get a chance to participate, the pre-construction Richmond Concord Gardens condo information brochure with floorplans and associated price points will be released soon. Lots of new purchase incentives will be available upon the grand opening so make sure you register your interest today to reap the benefits. The pre-construction Richmond Concord Gardens condo project follows other highly successful Concord Pacific Richmond real estate developments. The most notable recent projects include Omega and Monet. More info online at www.concordgardens.ca.